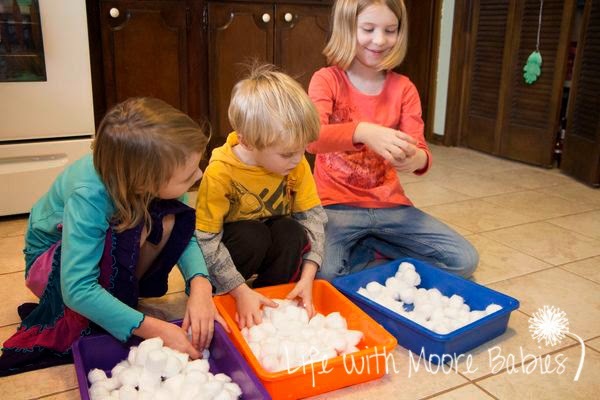 This months Child Led Sensory Bin Challenge is Cotton Balls! Like the other challenges, the kids were given the challenge material with no instructions about what they should add or how they should play. 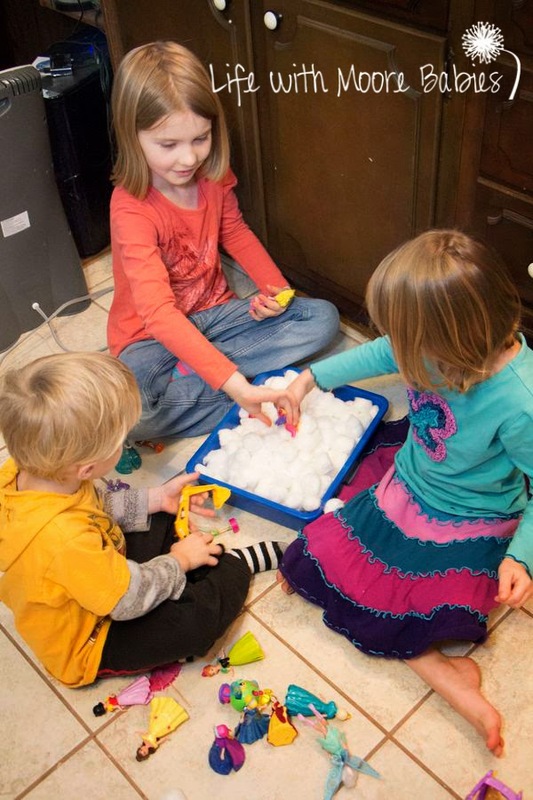 Cotton balls are pretty familiar to my kids, so it wasn't too surprising that they didn't spend a lot of time playing with them before running off to get other toys. Like always Eli came out with some vehicles. 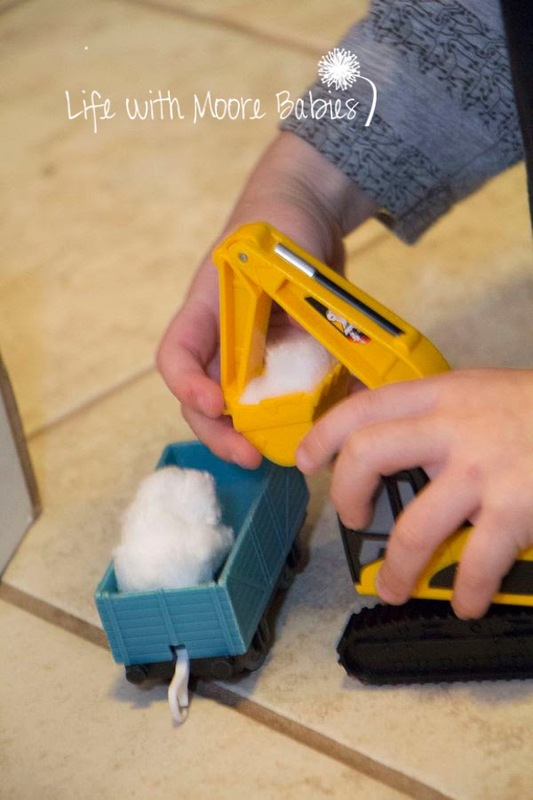 He started with some trains, and then decided it would be more fun to have construction equipment to help fill his trains. He happily scooped and dumped and pushed his cotton balls around the bin and floor for a while. 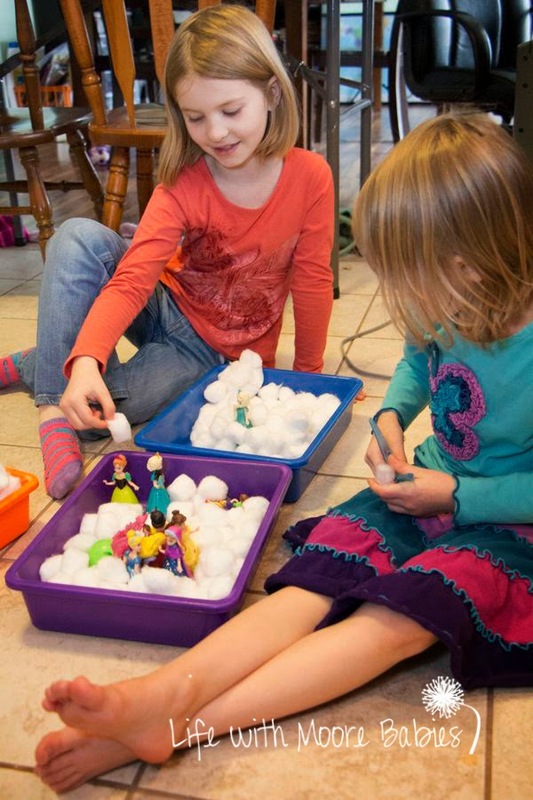 The girls appeared with small dolls, and they started a story about their princesses in the snow. Following their stories is difficult when they each start a completely different story and then somehow merge them. I really don't know if they follow them entirely! 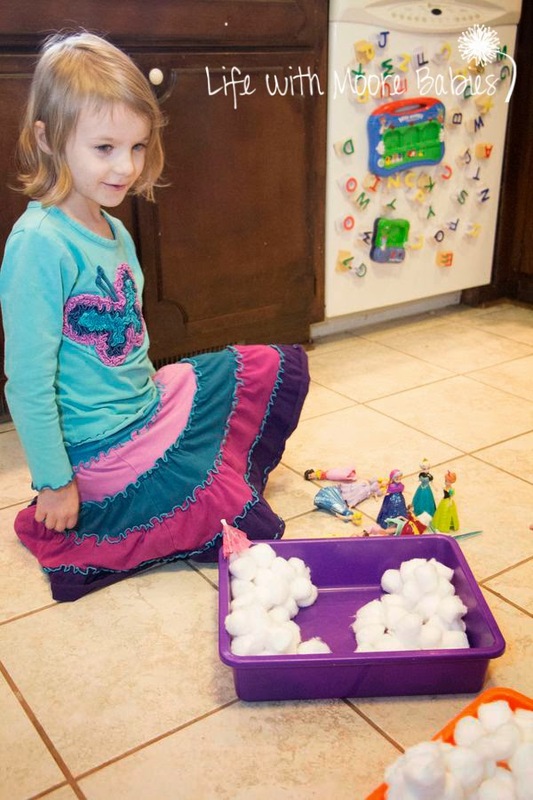 Somewhere along the way the princesses all got into a snowball fight, and then all the kids ended up combining the cotton balls into one container to play. Unlike our usual sensory challenges, they did not play together very long. Unfortunately play got out of hand way too quickly, so it had to be put away. 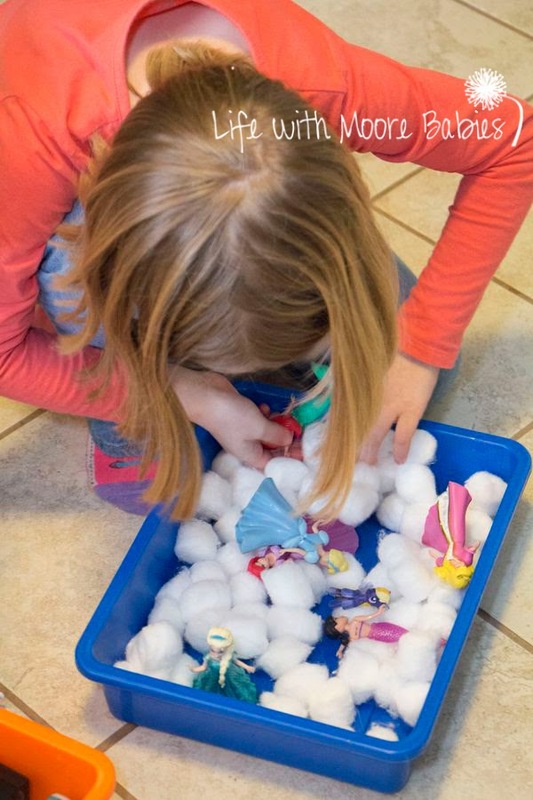 Luckily cotton balls are easy to clean up and easy to keep around for future play! 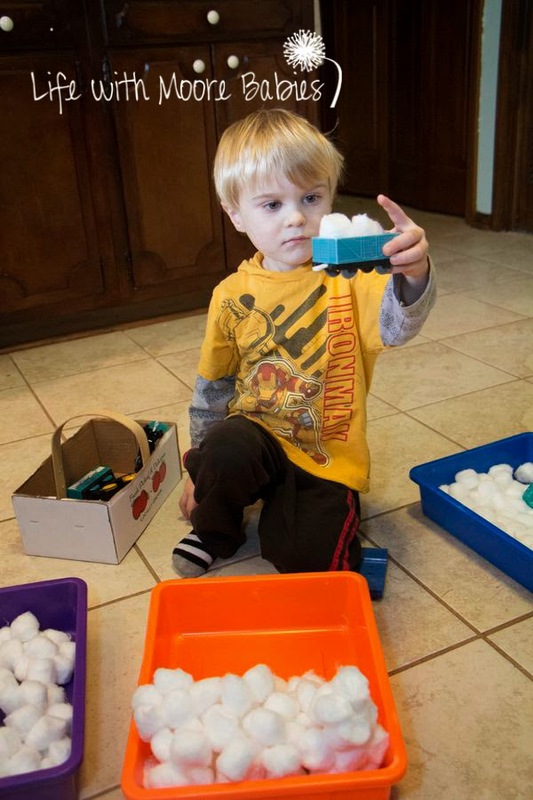 Head over to Little Bins for Little Hands to read more about the monthly Sensory Bin Challenges! You can also check out the past challenges we have participated in!